Triple Gold Classic Slot Guide & Review - Casino Answers! 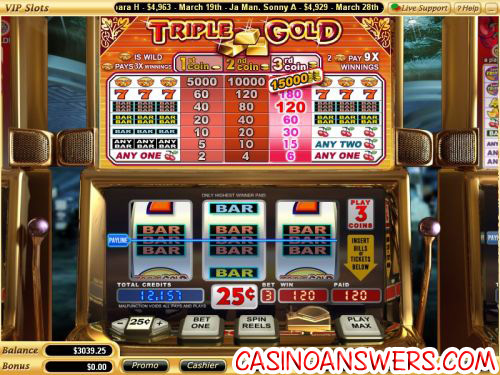 Triple Gold is a 3-reel, 1-line multi-coin slot machine with a wild symbol from Vegas Technology. You can play the Triple Gold slot machine at VIP Slots Casino and Online Vegas Casino. Triple Gold has a lot of realistic sound effects that add to its presentation. This is the same as any other Vegas Technology slot machine, but that doesn’t mean it isn’t worth mentioning. The symbols in Triple Gold are fairly typical slot machine symbols, such as cherries, 7 symbols and bar symbols. There is also the Triple Gold logo, which acts as a wild symbol. The great thing about the wild symbol is that if it appears in a winning combination, it will triple your winnings. If you’re lucky enough to get two wild symbols, you will multiply your winnings by 9X! To play Triple Gold, set your coin value. Coin values start at $0.10 and go up to $10. Other bets are $0.25, $0.50, $1 and $5. Then, hit “Bet One” to play as many coins as you wish (up to three) and hit the “Spin” button. Alternatively, you can hit “Play Max” to play the maximum bet of three coins. If you can line up a winning combination on the single payline in the center, you will win. Triple Gold’s top fixed jackpot is an incredible 15,000X, which means you can win up to $150,000 playing the Triple Gold slot! To win the top jackpot, you must hit three Triple Gold wild symbols. With Triple Gold, Vegas Technology has released yet another top-notch slot machine. Not only does it have wild symbols, but also you can win up to 15,000 coins! Most video slots don’t even have a jackpot that high. If you’re looking for an online casino where you can play Triple Gold and get a generous signup bonus while you’re at it, we recommend VIP Slots Casino. There you can get 100% up to $777 bonuses on your first three deposits. Sign up today at VIP Slots Casino! Are US players allowed to play the Triple Gold slot machine? Yes, Vegas Technology casinos such as VIP Slots Casino are very US-friendly. You’ll also have over 100 different casino games to choose from. You can read our full in-depth review on VIP Slots Casino. Do I need to download any software to play Triple Gold at VIP Slots? No, you don’t have to download any software. VIP Slots Casino offers both download and instant play versions of their casino and Triple Gold is one of the games offered on the instant play version. If you don’t have Flash installed on your computer, you can download the newest version of Adobe Flash Player. Does Triple Gold have a progressive jackpot? While the jackpot is fixed and not progressive, at 15,000 coins, you don’t need a progressive jackpot on Triple Gold! If you are looking for a progressive jackpot, you can find several at VIP Slots Casino including Mega Money Mine, Pay Dirt, Win, Place or Show and Red, White & Win.